Manchester City look set to sell Joe Hart in the summer transfer window after he was sent out on a season-long loan to Torino and now they have set their ‘top 6’ asking price according to The Times. Hart isn’t fancied by boss Pep Guardiola resulting in him leaving the club temporarily this season, though it is expected to be made permanent in the summer. Whilst Joe Hart has impressed Torino during his time there, they remain unable to pay the funds needed for City to allow him to move. The price tag, along with his £100,000-per-week wage demands means he’s out of the question for a number of clubs, however he could move to a top 6 side. Manchester City were set to ask for around £15 million for the England international, but their expectations will rise if he is to move to a title challenging side. 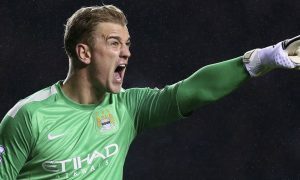 That means Manchester City will now expect a figure of £20 million if any top side will want to take Joe Hart away from the Etihad Stadium, and a number of clubs have already been eyeing up his signature.